New day, new drama. Entertainment website THE NET is reporting that Davido's cousins and label mates- Sina Rambo and B-Red had a nasty fight with their more popular cousin in Atlanta. According to THE NET's story, the reason for the family feud stemmed from Sina Rambo and B-Red believing that Davido was doing little to promote their works and was intentionally releasing singles and music videos to overshadow their singles. "Sources tell us a big fight allegedly ensued between Davido and cousins B Red and Sina Rambo some weeks back in Atlanta – The cousins had accused Davido of not doing much for their careers as much as he should after they chose him as the label’s front line act. They also accused him of not giving them a chance to fully promote their new singles only to overshadow them at any given chance. "- THE NET . The fight between the cousins was physical which led to properties being damaged in their Atlanta home. Davido left his cousins in Atlanta to perform alongside Nas in Houston. After his performance he flew straight to Nigeria leaving B-Red and Sina Rambo stuck in Atlanta. B-Red is back in the country, Sina however is still in Atlanta. B-Red who is Davido's hype man hasn't been with him on stage in his last couple of shows. He was also conspicuously absent at Davido's mum's remembrance. After the clash, B-Red and Sina Rambo are planning on leaving HKN. 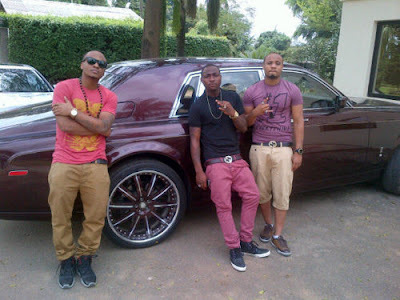 B-Red and Sina Rambo are the sons of Davido's father's senior brother. Sina Rambo released his debut single 'Ijo Sina' featuring Davido last October. B-Red dropped his introductory single 'Insane Girl' featuring Davido in February.